It was a beautiful day on the river during the 51st running of the Red Moshannon Downriver Race on March 31. In kayaks, canoes and on paddle boards, 136 people crossed the finish line after navigating 7.5 miles of the fast waters the Moshannon River. While the river was lower than last year, it was a warm, sunny day for racers. 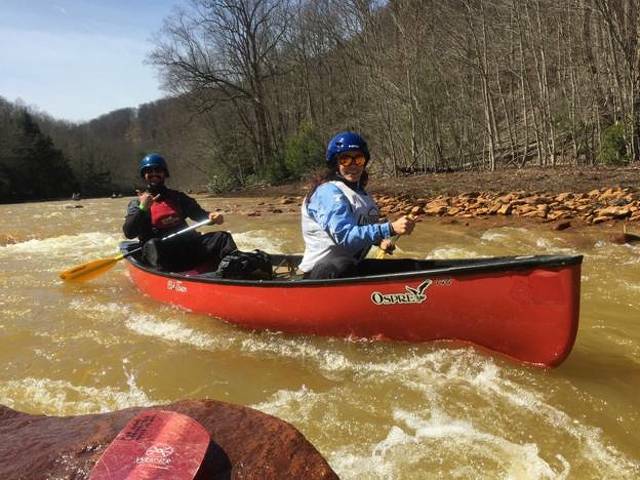 Ross is part of the Friends of Moshannon Creek, a group of local water sport enthusiasts who took over the organization of the race this year from Tussey Mountain Outfitters in Bellefonte. There were a variety of water crafts and classes on the water, but “top dog” Alex Vesey was the first to cross the line in 56:33 in a single-person kayak. Dan and Evan Jones paddled the first canoe across the line in an hour flat, while Teresa Stout and her teammate had the first canoe in the Century Class to cross, doing it in 1:02:07. The first woman to cross the line was Rebecca Renner in the whitewater kayak division at 1:04:15. Ed Sharp was first in the open master division in 1:03:40. Skylar Jackson won the youth solo division with a time of 1:08:45. Way Best was the first paddle boarder to finish in 1:13:24. And, Tina Fisher was the fastest woman paddle boarder at 1:14:21. Racers enjoyed a post-race banquet, where awards and draw prizes were presented, at St. Severin’s social hall in Drifting. The full results listing can be found on the race's Facebook page, www.facebook.com/redmorace.